I am 56 years old, divorced, diagnosed with breast cancer when I was 47 and while I was recovering, my husband started having affairs (who knows? maybe before I was diagnosed). The communication in our marriage had deteriorated, but I was trying to make it better, and when I discovered his infidelity, he agreed to go marriage counseling and I arranged it. The first thing the counselor said was, "you may not see that women again," And the first thing my ex-husband did was see the woman. John Edwards is/was apparently contrite; my ex-husband certainly was not. But in the final analysis, does that really make a difference? Betrayal is betrayal. How do you trust them again? Elizabeth lost her son to a unimaginable accident when he was 16. How could the universe take him like that? Will time stop as a result? Can she stop time and reverse things so that Wade comes back? Her innocence, and that of her family, was snatched away in an instant. No opportunity to say goodbye, to tell him one more time that you loved him. It's not just a death. It's an existential death. All of a sudden, you're in Auschwitz and you're going stay there. Always. I disgree with readers/reviewers who say that time heals or eases things. That's because they can't conceive of living in ground zero for the rest of their life as a result of such a massive, unimaginable tragedy. Sure you go on again, you laugh again, you eat a good dinner, you read a good novel. But this kind of tragedy sends your heart into Auschwitz and you never get out, ever. So that's what Elizabeth means when she says that you have to change your view of your own life. She means that you have to build a life inside the parameters of Auschwitz. How do I know this? Because my mother was murdered at work when I was nine years old, by one of her patients. She was a psychiatric social worker and the patient had a psychotic break and stabbed her to death. Them, we survivors who loved her went insantly into the death camp, and never came out again. So breaat cancer, infidelity, and tragic death -- do I ever understand. That being said, this book puts me in a place I have often gone to all these years. Do we choose to go in the direction maturity, self-containment, understanding, forgiveness? Is that how we (Elizabeth and I, and others in our situation) honestly feel, or at least aspire to? Sometimes I think we do, and that it's the only healthy way to go; and sometimes I simply resent the whole thing -- that I should even have to make that choice to begin with. We survivors -- we didn't hurt the world, we didn't betray the world, it betrayed us. It took from us. It took everything from us. So my response, sometimes (often), is "F.U." And if I want to use the most scatalogical language to describe how I feel, if I want to display my rage in any way, at any time, to anyone, regardless of whether it's fair or not to them or to the world, too bad! The world wassn't fair to me, so why do I have to be the bigger person? Since the world wasn't fair or rational to me, why do I have to be fair or rational with the world? I'm in Auschwitz, so all bets are off. The rules don't apply. I don't know if Elizabeth feels that way or not. But I think she probably does. She sort of touches on the rage in the book, and the choice she makes every day to find joy and stay sane. But I would have liked to see more in-depth detail on her personal struggle between rage and sanity, between rage and forgiveness. I am a great admirer of Elizabeth Edwards. It takes enormous courage to write about such personal and painful subjects as your own cancer, the death of your father, the death of your son and your husband's affair. She is certainly resilient, a quality one needs when faced with the kind of betrayal she has faced--both from her own body, and from her husband. As the author of a book about older women and divorce, He's History, You're Not: Surviving Divorce After 40I am nowhere near as resilient as Edwards--I became clinically depressed when my husband left me for another woman. Eventually I moved on but it took a long time and a lot of therapy. It was touch and go for a while which was scary. However, I did run across many divorcees who went through worse experiences than mine, who were remarkably resilient and bounced back from incredible adversity. Resilience is both our genes and our upbringing. If we're lucky enough to have a sunny disposition to begin with, and the kind of parenting which sets us up to feel secure and capable in the world, we can rescue ourselves when we need to. If we didn't have that kind of parenting, we can still overcome obstacles, but it's a hell of a lot harder. 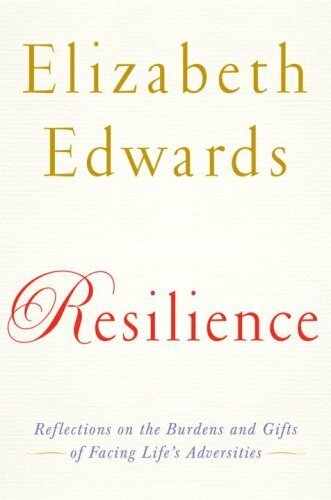 Edwards is a role model for women who face tragedy and who need inspiration and the reassurance that it is possible to survive just about anything. I found Elizabeth Edwards' opening chapter on her Dad compelling, empowering, and inspiring. Two weeks ago, I flew home to care for Mom. She wanted to get better, but her digestive system had inexplicably shut down. She was recovering from surgery and unable to eat more than a few bites per meal. The food at the 24-hour nursing facility was terrible. I cleaned by night and cooked by day...brought in alternate lunches and dinners...waterboarded her with food. Sometimes she would eat just once bite out of a whole entree. But Mom did not give up on herself, and I did not give up on Mom. "Do NOT go gentle unto that good night." The breakthrough was my finding a drug side-effect that had been stanching her appetite among her dozen drugs. Now she's eating full meals and slowly regaining strength. Don't trust the "experts" to know what they are doing. Mom says I had won her trust. Priceless. The one thing that made me wrinkle my brow was that Elizabeth felt diminished by what her husband did. I don't think she should. Women often try to be all things to all people, and that is humanly impossible. Regarding the chapter on Toshiko...who put on a resolute face despite her physical and emotional scars from the first atomic bomb. Geishas are trained to not show negative or strong emotion because that leads to wrinkles, which limits one's career. Emotional botox.